27.8 cu. ft. Dual Door French Door Refrigerator with a 18.9 cu. ft. Refrigerator! OVERALL: The Samsung RF28HDEDBSR Stainless Steel French Door Refrigerator is one of the better french door refrigerators in the Samsung line. One of our favorite features is the DUAL DOOR feature which provides convenient access to your more on-the-go items. Well designed and hidden, you simply need to squeeze on the inside right door to open this door. There are slide out shelves in the exterior portion allowing you easy access to sodas, condiments and other commonly used items. By having this separate section, you avoid needless opening and closing of the fridge which minimizes the loss of cold air -- saving you money! 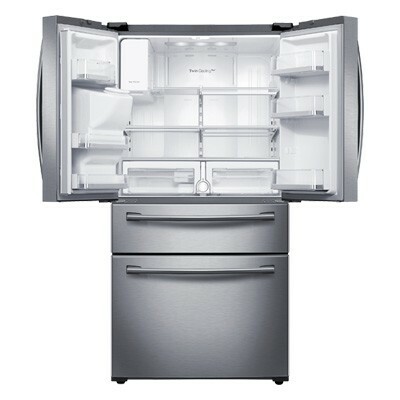 NOTABLE FEATURES: The Samsung RF28HDEDBSR French Door refrigerator has a number of features that are worth mentioning. TWIN COOLING PLUS SYSTEM: The twin cooling system is exclusive to Samsung and minimizes smells from crossing from the freezer into the refrigerator and vice versa. This keeps your foods as fresh as possible. LED LIGHTING SYSTEM: The highly efficient LED lighting system helps to brighten even the darkest corners of this refrigerator. 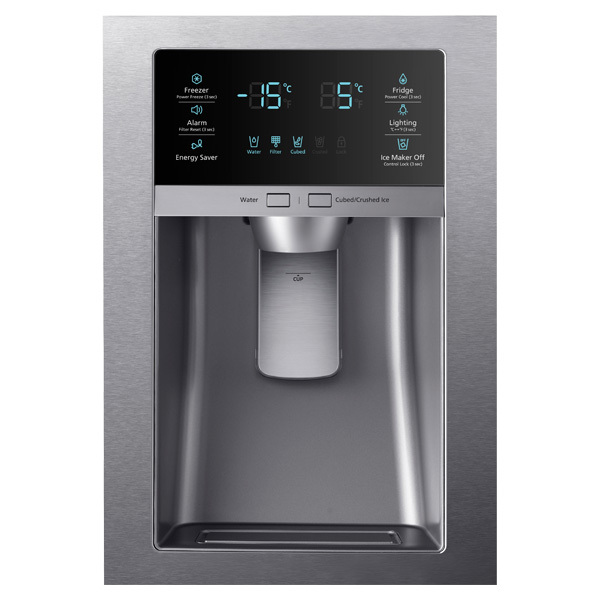 AUTOMATED FILTERED ICEMAKER AND WATER DISPENSER: The internal ice maker is filtered providing fresh ice as often as you need it. And the in-door water filter has a six month life span saving you money on expensive replacement filters. DOOR ALARM: Have kids that always leave the door open? This door alarm will make that issue a thing of the past. SURROUND AIR FLOW: Samsung's Surround Air Flow system manages to keep a consistent temperature in all parts of the refrigerator. No more "frozen" spots or "warm" areas to worry about. HUGE FREEZER CAPACITY: With 8.9 cu. ft. capacity in the freezer, there's more than enough space for all your favorite frozen foods as well as baskets to help keep them organized. INDICATOR LIGHTS: The front control panel is loaded with important indicator lights such as a filter change indicator. Seems like no big deal, but not all refrigerators have these warning lights. IN-DOOR PIZZA POCKET: One of our favorite features of this refrigerator is the In-Door Pizza Pocket -- a thin compartment on the inside of the door designed to hold a 16” pizza box. You'd be surprised how often this comes in handy when looking for places to store a frozen pizza. CAPACITY: TOTAL of 27.8 Cubic Feet of storage. 18.9 for the refrigerator and 8.9 for the freezer. COLORS: Stainless Steel -- we're unaware of any other color choices. $3725.00 -- however, we've seen it online for as low as $2400.00!